I started this Facebook Page back in April and I’ve accumulated quite a lot of posts, comments, messages, and photos. I would be devastated if anything happened to all that data. Yet that could happen - a hacker, an error on my part, or a virus, or even sabotage, could result in the loss of some, or all, of my Facebook page (and yours too!). Facebook allows you to download a copy of your personal Facebook data so that you always have a copy in case something happens to Facebook. But they don’t offer the same for Pages. 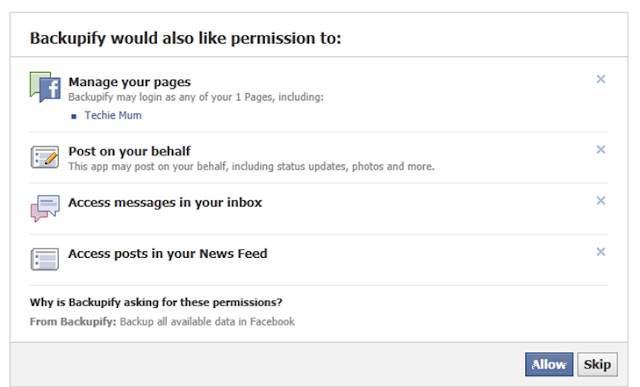 Luckily there is a way you can back up your Facebook Page so that if the worst did happen you could restore it. Backupify allows you to backup cloud-based data, that includes Facebook, Twitter, Gmail, LinkedIn, Google Docs, Google Calendar, Flickr, Blogger, Picasa, and Zoho. I hadn’t really thought about all the cloud-based services I use before, but looking at that list, I have a Gmail account; I use Blogger for my Techie Mum blog; I use Picasa for photo editing and creating collages; Google Docs for adding documents to my Blog for my students to access; LinkedIn for my business profile, and of course, Facebook and Twitter. That’s a lot of data I could lose if something happened to those apps. So, I did a bit of backing up with Backupify last night, and it was so easy. I’ll run you through the steps of backing up a Facebook Page, but the process is the same for whichever app you choose. 2 Choose which level of backup you need – more about the different accounts below. 3 Choose the accounts you want to protect. 5 On Facebook I had to ‘Allow’ Backupify to access my account so that it can backup my Page. 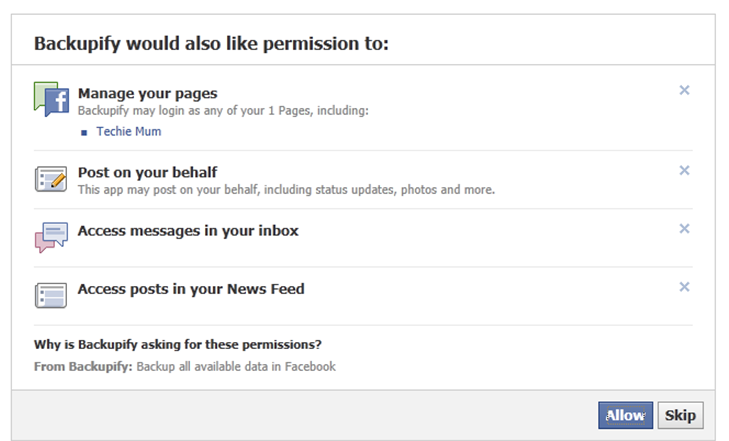 7 Click on Continue configuration and you then choose what you want backed up from your Facebook Page. I had no idea how many different spots on Facebook are all linked to my Techie Mum Page – there’s 30 different options you can choose to be backed up – as well as posts, there’s photos, events, groups, notes, comments, statuses, and more. I just chose everything, then clicked on Save Configuration. 8 Backupify starts the first backup immediately. 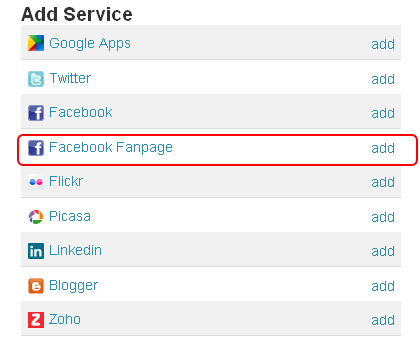 9 To add another cloud based account, click on Add Service. That’s the basic set up, and for each personal app you select you’ll go through a similar process – select the app, login to give Backupify approval to access your account for backing up – select what you want backed up. If the worst happened and your accounts were lost or damaged, restoring them from Backupify is either a one click restore, or a quick download to your computer, depending on the individual application. Backupify is free for cloud based accounts, with a 1GB storage limit. The free account will back up your chosen accounts once each week. $4.99 per month covers five accounts with a 10GB limit and backs up nightly. $19.99 per month covers 25 accounts with a 50GB limit and backs up nightly. Backupify uses Amazon’s Web Services and all data is transferred over encrypted channels. But one of the ways I like to check up on something I’m about to use is to check who their backers are – who has invested money in them. In the case of Backupify, one of its latest investors is Symantec – that’s the company that brings you the Norton Internet Security products. So, if Symantec, who are all about security, considers Backupify a good bet, then I’ll give them a go. It only took a few minutes to set up Backupify and it does give me peace of mind knowing that if something did happen to all my cloud-based data it isn’t lost forever.